SurePath™ 151 coextruded tubing is a combination of PE and PVC, specifically designed for administering unstable solutions such as nitroglycerine and insulin via medical tubing. Its unique PE layer construction minimizes absorption into the tubing walls, reducing dosage inconsistencies. The outer PVC layer provides the bonding capabilities necessary for most assembly operations. SurePath™ 252 has similar attributes, except the outer later is TPE, specifically designed for administering unstable solutions in applications that require plasticizer-free medical tubing. Both options offer superior adhesion between layers with no sacrifice in clarity and flexibility and are ethylene oxide (EtO) and gamma sterilizable. 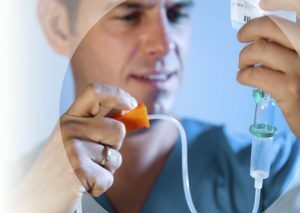 Biopath product line was specifically formulated to address the problems and limitations associated with existing medical grade polyurethane (PU) tubing. 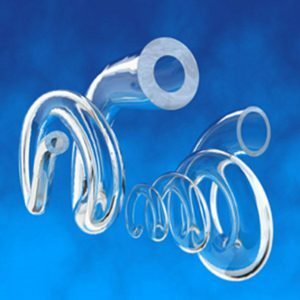 By utilizing a non-PVC outer layer we are able to provide a superior medical tubing product at a competitive price that is solvent bondable and can withstand EtO & gamma sterilization. The PU inner layer can be configured to achieve the desired stiffness required for your product line. Natvar’s BioPath product line is produced with Class Vl materials. Other product benefits include chemical resistance and compatibility with a wide range of operating temperatures. 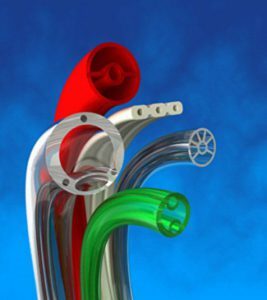 IV tubing is produced in cut pieces or coils to meet your design needs. Our in-house engineered coiling system was developed to provide a constant tension and traverse to accommodate your automated assembly equipment. 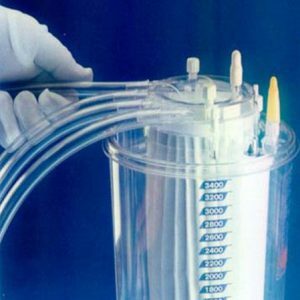 Our medical tubing is available in standard or non-DEHP formulations and durometers from 55 to 95, Shore A. 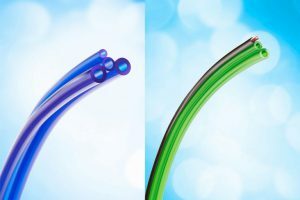 Bubble or transition tubing eliminates the need for plastic connector fittings. With a “bubble” spaced at designated intervals, Natvar’s transition tubing is designed to provide a more acceptable interface. This should result in less platelet damage and may aid in reducing total blood hemolysis when using medical tubing. SurePath™ 252 has similar attributes, except the outer later is TPE, specifically designed for administering unstable solutions in applications that require plasticizer-free medical tubing. Both options offer superior adhesion between layers with no sacrifice in clarity and flexibility and are (EtO) and gamma sterilizable. Coextruded striped tubing is produced using technology which fully embeds the stripe into the medical tubing wall. This provides clean, smooth surface and a non-bleeding stripe of uniform depth and dimensions. This process eliminates any surface irregularities such as bumps or distortions, thus reducing the chance of leakage when assembled into sets. Medical grade colorants are used to produce each individual stripe. Natvar’s brilliant stripe definition allows for easy identification of specific lines. 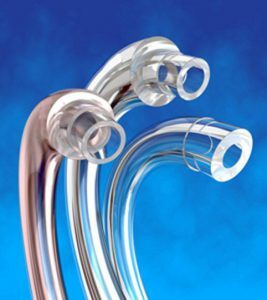 PowerPath coextruded medical tubing is custom-processed for medical devices that have power requirements. Up to four coated wire/wire bundle configurations can be “thermal bond” coextruded and bonded with irrigation/suction type tubing. This process eliminates the need for foot pedals or switches to operate power units. Natvar’s proprietary processing technology provides a cost-competitive solution for this component. Cardiovascular tubing is designed to provide maximum performance in today’s cost conscious environment. With our state of the art in-line monitoring systems, we are able to hold and maintain strict control parameters required by our customers for medical tubing. 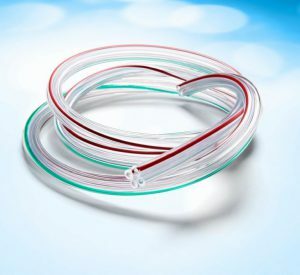 Natvar cardiovascular tubing has excellent clarity and flexibility. We offer custom and standard sizes in a wide range of durometers. Silicone replacement tubing is a low-cost alternative to current silicone-based materials used for medical devices. 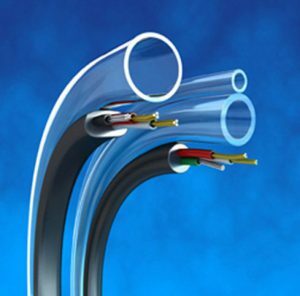 In pump applications, Natvar’s silicone-replacement tubing will stand up to the rigorous demands of most applications and be comparable with silicone tubing in performance and stability. Multi-lumen & micro-extrusion tubing is designed to provide maximum performance in today’s cost conscious environment. Our medical tubing is available in multiple lumen configurations with radiopaque stripes in a wide range of materials. We offer multiple fluid path options with extremely tight tolerances. Natvar also offers multi-lumen bump tubing designed to eliminate costly luer tapers in your finished product. 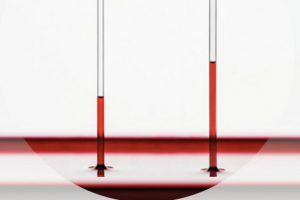 LipoPath™ tubes are a cost-effective, hydrophilic, clear alternative to glass and plastic hematocrit tubes that require a drying process for plasma and heparin coating. The LipoPath tubing line features a coextruded outer layer and a proprietary inner layer. Its shatter-resistant properties reduce the risk of contamination during lab testing and study procedures. Para tubing is designed to provide maximum performance in a cost-effective manner. We provide multiple medical tubing configurations, including orientated stripes. Our in-line thermal or off-line solvent bonding process provide the right performance characteristics for your application. Both process produce peel/pull strengths to meet your product requirements.